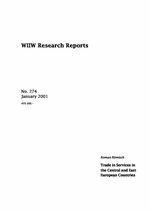 Trade in services, although often neglected by theory and empiricism, plays a quite influential role in the balance of payments of most countries. In the case of the CEE countries, services trade also enters another dimension: it is a helpful means in the modernization process of the CEE economies whose (producer) services, as of 1989, were far from the development level typical of well-functioning market economies. The first part of the present paper gives a theoretical and empirical overview of the services trade in eight CEECs, highlighting their strengths and weaknesses. The second part of the paper focuses on the services trade of the Czech Republic, Hungary and Poland with the EU in general and Austria in particular, thus also allowing for an examination of the advantages and disadvantages Austria has vis-à-vis the EU in trading services with the CEECs.